A Cleaner Home: Cat Genie Litterbox Review | Nicole, Deipnosophist. As you may know, I love animals. I was never very fond of cats, though, but not because of their behavior; I cannot stand cat hair nor cat litter. I have a very strong aversion to both. After marrying a guy with a cat, I had to learn to live with the disgustingness. I’ve changed litter exactly three times in six years. It smells so awful. When I was pregnant, my aversion was even worse. The second cat’s litter box was in our walk-in closet and I was starting to lose my mind. I couldn’t even walk in our closet. I’ve tried several different automatic litter boxes with mixed success. They delay the cleaning but the smell- though muted- is still there. Basically, there’s a big container of cat waste in the house. Gross. So, after a month of debate over the cost, I bought a Cat Genie. I installed it in the closet. It requires fresh water hookup and drain to a commode or laundry drain; I drilled a hole in the drywall to the bathroom and inserted the hoses. Installation was really easy. I was eight months pregnant and had no problems. Well, no problems other than figuring out how to haul myself up after lying on the floor to attach the water line! Once installed, it was fussy. It had a draining issue and a rotation issue within 10 days. Both led to the cat using the floor. I was ready to give up on my investment. However, since that first few days, there have been no problems. It is set to auto-clean daily and the closet smells like clean clothes again. After just a few months of use, we decided that the other cat should have one as well. But where to install it? The cats have to be separated, so it couldn’t be in the same room. All other commodes had no room for the unwieldy thing (21 inch diameter). The laundry room is the size of a postage stamp, so no way. But I could not have that disgusting clay litter in the house any more. So we decided to install it in our mechanical room, forgoing the simple setup provided. 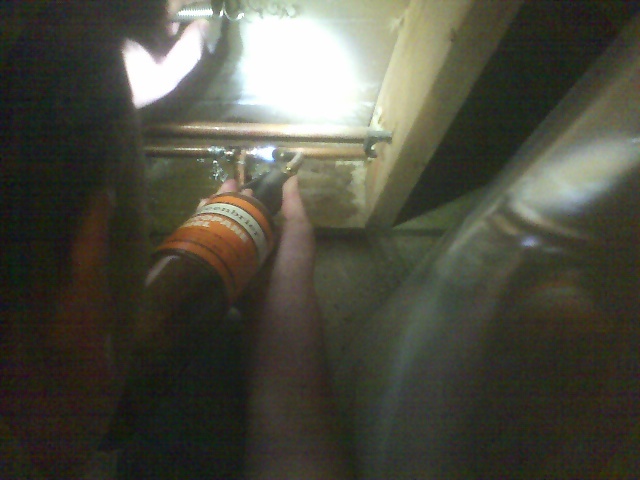 We cut into an existing cold water line and installed a faucet. The drain line drains to the grinder pump. No more lugging clay litter around, no more smell, and certainly less bacteria on the cat’s toes after each use. I can reorder the stuff I need- with free shipping- in about 2 minutes instead of a trip to the store. Several months’ worth of supplies fit in a small box, not a bunch of big, heavy boxes of clay. Maintenance takes 30 seconds monthly (to snap in a sanitizer cartridge), with one in-depth 30 minute cleaning annually. Compare that to 10-15 gross minutes weekly and in-depth cleanings every month or two. The only downsides are: the sanitizing solution smells like baby powder and I am allergic to most perfumes. The little washable plastic pellets are so light that the cat tracks them much farther than regular litter. I had to buy some startlingly expensive litter mats so that the litter could be trapped and reused because the litter refills are ridiculously priced at $22. Even so, the operation cost is less than a regular self-cleaning litter box using premium clumping litter. My last self-cleaning clay litter box was $200. For $64 more, I now have a litter box that helps me keep my sanity. This entry was posted in Reviews by knharter. Bookmark the permalink. It lasts forever and never smells, in fact, smells natural and nice and allows you to scoop without even getting anything on the scooper. I scoop everyday which is amazingly simple and keeps the cat happy and everything clean. It’s flushable also so there just isn’t any problem at all. I usually just scoop into a small paper bag and throw in the garbage(doesn’t smell). As you’re probably aware the product name was removed. I’m really curious about the product. Could you send me the info…if this site will allow my email address to be printed? Or could you somehow camouflage the brand name so that it will not be removed. You could try to send a message to secretpash at gee mail dot com. Thanks. Janet- You must not have read my review, or you’d know I no longer have any worries. I still love both of my CatGenies and my kitties are happy too. You don’t work for that company who makes that other litter? Riiiiiight…. I too love my Cat Genie box – I have 4 cats – the litter maid auto scooper would fill in 2 days and the waste would clump and clog the rake. I was about to install a cat door to the outside and risk losing my beloved cats to any local hungry coyotes, but then I saw a commercial for the Cat Genie. It sounded too good to be true and was expensive but I was out of options, so I apprehensively purchased one in August 2007. It has changed my life, and my house. No more worrying about cleaning the litter box every other day, No more smelly house, no more smelly cats. It took awhile to hook it up in my laundry room, it came with a water line split which was easy to install in the faucet for my washer, but the sewer drain was not wide enough for the washer drain hose and the Cat Genie drain hose. I called customer service and they recommended a part that I was able to get at Home Depot, it worked great. With 4 cats I have it on a 2 a day cleaning cycle. Also, with 4 cats (one with long hair) I have to do a full manual cleaning once a month or else it will start to clog. I go through 2 Unscented sani-cartridges a month so I don’t even have the baby powder smell – where do you get free shipping on supplies? The only down side for me is my inability to plan for anything so I often run out of sani-solution and have to wait several days for shipping with a dirty litter box. It would be nice if local stores began stocking the Cat Genie supplies. My processing unit began to malfunction after 6 months but that is not a problem since it is still under warrantee – they sent me a new one. All together I have been very pleased with my cat genie they have great customer service and I recommend it to all my cat loving friends. The litter is everywhere. I too have spent money on expensive mats only to find the stuff in my bed and furniture. I sweep twice a day trying to keep up with it. And that means sweeping twice a day – the whole apartment. But the worst is the ungodly stench. If the unit misses one little piece, you get the smell of cooked feces. You don’t like baby powder? I can’t have the unit run if there is the remotest possibility of a guest coming over and I need a good two hours, Oust and open windows after a run before someone can come over. And then there are all the malfunctions. This week 6am has been a nightmare…all week. If it is not one thing it is another. This unit is less than a year old. I’m looking into dumping this thing in the dumpster in the next few months, calling it a $300 learning experience and going back to the twice daily scoop-a-thon. I would rather scoop than bear that stench. We have one and we love it – There are a few downsides, like the litter scattering (then again, our old litter box scattered too) but overall I agree with your assessment KNH, it’s amazing. They recently released a dome lid too, so if your cat likes covered things that would reduce the scatter – our cat won’t go in anything covered, so we got the high side walls which helped a bit. There are some things to think about before you go cat litter box shopping. There are many different features you will want to consider. … I would soooo gladly take a unit off an unhappy user. I’ve been dying to try it out with my two litter gremlins… living in a studio is tricky with icky normal litter and ugh if the price wasn;t so much I would have had like 5 installed by now. you and me both Krys! Anyone wanting to rid yourself of the eyesore, my 3 babys would love it! And so would my husband….Any hints on the best place to purchase one? I saw an infomercial about this last night and am really interested in one but would like to know how it is running now that you have had it for a while. I’ve seen several reviews that said they started having major troubles after about 6 months.. The rest said they loved it. I see you posted your review in August 2007 and REALLY would like to know what you think about it now. PS it’s your husband’s cat and He made you clean the cat box and install the cat genies? What a bum! Pregnant women should not handle cat litter as it has dangerous germs in to them!! I have two cats inside, another out side (would not use the litter box, keeps the dog company). I have 4 indoor / outdoor cats so my box gets a lot of use. It has survived the last 2 years and the cat genie customer service have been quick to solve the 2 problems I have had at no cost to me. My problems have always had to do with the draining feature of the box – after a year it must have lost some power in its hopper / processor. It couldn’t get enough momentum behind the water to push it out the drain hose. This has happened twice in 2 years. The first time they sent me a new processing unit for free and that fixed it. This time Cat Genie Customer Service just sent me the new Turbo Hopper for free. I will be installing it today and hope it fixes the problem for good. They also recommended shortening my drain hose. So in the end – it may take some tweaking to get the right setup, but with only 1 problem a year on average for 4 cats and not having to think about it otherwise, I love it. Way better than any other litter box options on the market today. And the customer service is awesome. I have found a solution to the litter scattering everywhere….buy a Roomba! Hello! I have been considering purchasing the cat genie for a few weeks now and I think I’m gonna take the leap. Where did you purchase yours for $264? The cheapest I’ve been able to find it is $299 and they are currently out of stock on this particular website. Also, has anyone had problems with their cat getting acclimated to the new system? I’m afraid my cats will decide they don’t want to figure it out and start using the floor instead. I’m just so tired of the traditional litter box – with 5 cats, it becomes quite a burden.